InterContinental Hotels Group (IHG) revamped its IHG Rewards Club loyalty program last year (named changed from Priority Club too) and qualifying for Gold and Platinum status became more challenging. In 2013, IHG Rewards Club introduced new benefits for elite members including Welcome Amenity (points or food and beverage item) in Europe that is expanding to North America this year. You can read more about the IHG Rewards Club elite benefits here. Unlike many other programs, IHG Rewards Club continues to do straight matches to their Gold or Platinum status without fast track requirement. You can either call 1-888-211-9874 (If you are not located in the United States, just use Skype), tell the person that you would like to do a status match from the competitors program and follow the instructions that they give you. You are likely asked to email screenshot of the competing programs web page showing your status directly to the person’s email that is speaking with you. If the agent tries to give you the generic ihgrewardsclub@ihg.com email address, try to get their firstname.lastname@ihg.com email address for faster processing of your request. You can send an email to ihgrewardsclub@ihg.com and request a status match to IHG Rewards Club Platinum. Remember to include a screen shot of the competing programs web page that shows the status that you have and the date. Don’t forget to include your IHG Rewards Club account number in the body of the email. IHG Rewards Club used to be rather slow at replying to emails sent to the generic address, but they have sped up the reply time. You should receive a reply within 24 hours. If you need your status match faster, you must request the agent’s IHG.com-ending email address and they can process the match instantly for you after receiving supporting documents. 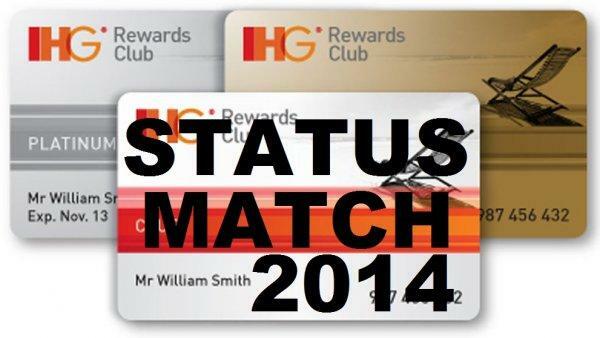 IHG Rewards Club status match is officially only once in a lifetime (of the account). Status matches processed on or after October 1, 2014, will have the status matched for rest of the 2014 and 2015 as well. Gold Ambassador members that match to Platinum status will get a new Platinum Ambassador package that will come with another free weekend night certificate and some may also get a a voucher for points that you can deposit to your account (5K, 10K or 15K). IHG Rewards Club has many many promotions that a member can participate in (access them all here) that will help earning points and free nights faster than with most other programs. The Gold and Elite benefits used to be so-so, but they have tried to introduce new ones such as the amenity points discussed above to get them more inline with Hiltons and Marriotts of the world.